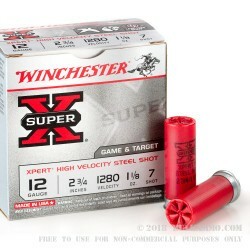 This versatile 12 Gauge shell is one you’ll enjoy firing while target and clay shooting as well as hunting for upland game such as quail, pheasant, dove, and rabbit. 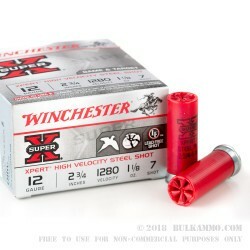 It is loaded with 1 ⅛ ounces of Winchester’s proprietary non-corrosive steel #7 birdshot, which will not damage the precious ecosystems you enjoy hunting in and satisfies federal and state lead free projectile regulations as well. With its thicker wad segment for increased barrel protection, you’ve got a shell that is good for your shotgun in addition to the environment. Winchester has fostered their legendary reputation for quality firearms and ammunition since their foundation in 1873, and their history is now practically inseparable from that of America’s. Their Super-X line of ammunition, introduced in 1922, serves to provide outstandingly reliable performance to hunters and target shooters alike.